Summer in Greece is inevitably linked with seafood. Fried calamari or kalamarakia tiganita is an all time favorite appetizer, best served with a splash of fresh lemon juice and a glass of cold Greek beer. 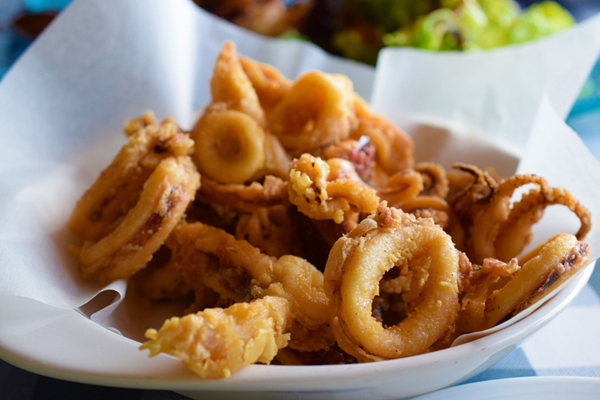 Fried calamari is served in every psarotaverna or fish tavern in Greece. Many people accompany it with fried potatoes and Greek salad. Most cooks prefer frozen squid as it gets crunchy on the outside and tender on the inside, but fresh calamari works well too. If you buy whole calamari, make sure to cut it in evenly shaped rings. Also, make sure to use vegetable oil for frying the squid. Last but not least, before frying the kalamarakia, remove any excess water before frying them – adding water to the sizzling hot oil will cause an oil splatter all over your kitchen. Now, let’s make kalamarakia tiganita! If you like this recipe, you can now pre-order “My Greek Salad – The Cookbook” for 100 more authentic recipes that bring an authentic Greek feast right in your kitchen! Greek Fried Squid, also known as kalamarakia tiganita, is a Greek meze with deep fried squid. Golden crust, tender calamari and a DIY squeeze of lemon is the secret to this recipe. Season the defrosted squid with salt. Preheat a deep skillet or a heavy-bottomed frying pan over low heat. Pour the vegetable oil into the frying pan. It should not be any deeper than half the depth of the pan. Turn the heat up to high. Dredge the squid in the flour and let sit for a few minutes. Alternatively, put the flour in a resealable plastic bag and add the squid. Shake gently to coat and leave the squid in the flour until its slightly soggy. Gently shake off any excess flour. Add the squid to the pan when the oil is hot. Check the oil by adding a small piece of the squid to it. If the calamari sizzles, the oil is ready. Fry the squid rings until they're crisp and golden brown on all sides. Make sure not to overcrowd the pan with squid - instead fry in batches. Remove them with a slotted spoon and drain on paper towels. Serve the fried calamari on a platter. Garnish with lemon wedges. 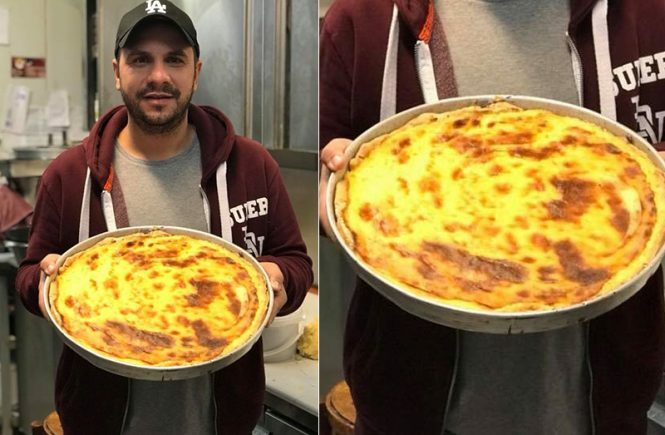 Enjoy your kalamarakia tiganita!